The book includes practical exercises that enable you to apply the ideas in familiar contexts. By doing the exercises, you learn how to think philosophically about change and unleash its life-changing possibilities. 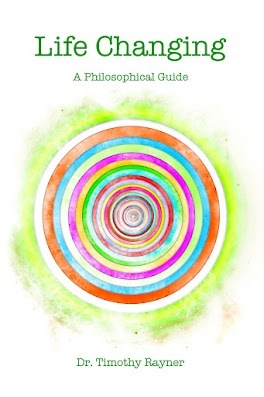 Life Changing: A Philosophical Guide is available on Amazon, Kobo, and iTunes. Check out the introduction to Life Changing on the P2P Foundation wiki. Life Changing marks the end of a personal journey. For the past fifteen years, I have been studying, teaching, and applying transformative philosophy in my own life, first as a doctoral student at the University of Sydney, then as a lecturer at the Universities of Sydney and New South Wales, and recently in my Philosophy for Change course, which I’ve run at the Centre for Continuing Education, University of Sydney. My guiding intuition has been that it is possible to distil from philosophical ideas a kernel of practical wisdom, which can be communicated through simple exercises that students can apply to their lives. This intuition is core to Life Changing. The book is structured about five practical exercises. Each incorporates a life-changing insight. The exercises show you how to muster the courage to change; how to control yourself like a Stoic philosopher; how to cultivate your Nietzschean will to power; and how to use Spinoza’s philosophy to supercharge your social life. They show you how to take adventure from the heart of crisis and fulfilment from the struggle with adversity. Fire your passion. Take an Existentialist approach to life and change. Get a grip on yourself. Cultivate tranquillity with Stoic self-control. Unleash your powers. Affirm life with Nietzsche’s thought experiment. Diversify yourself. Cultivate agility with Spinoza’s approach to friendship. Change time. Transfigure life with a visionary approach to change. I’d like to give special thanks to Mark Junkunc for his fantastic work on the front and rear covers, and Mat Peden for the laborious layout work. Gentlemen: I am (as ever) in your debt. I’d like to thank PalmerHiggs, my distributor, for the great service they offer a first time self-publisher. It has been a long process bringing Life Changing to publication, and through it all Joy Childs at PalmerHiggs has been consistently professional and helpful. Show PalmerHiggs some love by purchasing your eBook on their site. I am lining up speaking work to promote Life Changing. To book me or just throw around ideas, contact tim [at] timrayner [dot] net. I love the basic outline, Tim- this looks great! I’m interested to see where you chose to situate yourself on the philosophical to practical spectrum. I value both highly so it seems a constant balance. A fine balance indeed! I argue in this book that aspiring world-changers must attend to themselves in order to be effective on the ground. I identify resilience, agility, and vision as three fundamental qualities required to engage with volatile, uncertain situations productively and creatively, and offer philosophical insights, distilled in the form of practical exercises, to facilitate the cultivation of these qualities. The book is a workbook – a personal manual – for people (like yourself) who are assuming leadership roles to facilitate transition. I hope you enjoy the book, Jay. I’d love to hear your feedback! Very cool. I’m taking a similar focus these days, sortof in R&D mode around this notion of “life design” — how to create customized structures for ourselves to maximize flow, joy, effectiveness and successful collaboration. So I’m looking forward to checking it out!